Chinese speaking guide & driver service: Pick you up from the airport. Chinese speaking guide & driver service: Pick up from your hotel around 9:00. Then drive to Zhangjiajie National Forest Park. We will take the cable up to Tianzi Mountain to do about 2 hours sightseeing. Then transfer to Yuanjiajjie Scenic Area to see the the Hallelujah Mountains, the platform of Forgetfulness, the No. 1 Bridge under Heaven and so on. Later, take the Bailong elevator down the mountain. Drop off in your hotel. Chinese speaking guide & driver service: Pick up from your hotel around 9:00 am. Then visit Ten-mil Natural Gallery (mini train is optional), Golden Whip Stream, and Tujia Folk Custom Park. Drop off in your hotel. Chinese speaking guide & driver service: Pick up from your hotel around 9:00 am. Then explore the Tianmen Mountain National Forest Park, where you will experience a ride on the world's longest cable car up to the summit of the Tianmen Mountain, taking in the spectacular scenery as you do so. Once at the summit take a hike (approximately 2 hours) on the plank road alongside the Guigu Cliffs. 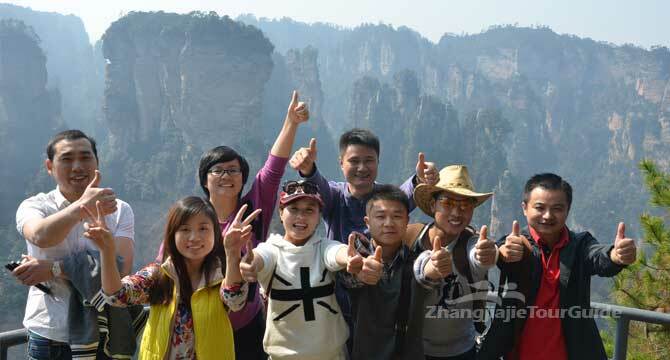 During the hiking, you can choose to experience the glass skywalk built along a cliff with an extra expense (RMB5/pp). After hiking, you will move to pay a visit to the Tiammen Temple and take the Forest Sightseeing cable car and back to the Tianmen Mountain cable car station and take the big cable car up to the middle station. And take a bus along the Tongtian Avenue (a famous mountain-winding highway in the world) to explore the Tianmen Cave. Conclude the trip with a transfer to the airport.